The word, “retirement” literally means to remove oneself to a quiet, secluded place. At times of high stress, this sounds great, if only for a short time to recoup, recharge and restore. Back in 1864, when Bismarck established the first government pension scheme, retirement was envisioned as a reward for years of hard labor, and for surviving to 65, since only very small percentage of the population did. My paternal grandfather was born in the 1860s and worked as a brakeman with the B & M Railway. My maternal grandfather was born in 1880 and was a printer, which involved hard labor. These men and their wives worked extraordinarily hard and few survived past 60. Fast forward to today, and most of us who are in our 60s can look forward to two more decades of (relatively) healthy life. My children, in their 30s, are likely to survive past 80 and probably into their 90s. And their children, my grandchildren will certainly become centenarians. Yet we continue to be saddled with the concept of “retirement” at 65. Why is that? Probably because those who are at that age object to any changes they would see as reduction in benefits, and politicians, who are in a position to make the change are too afraid of the backlash to propose moving the goal posts so far into the game. But it makes no sense at so many levels. 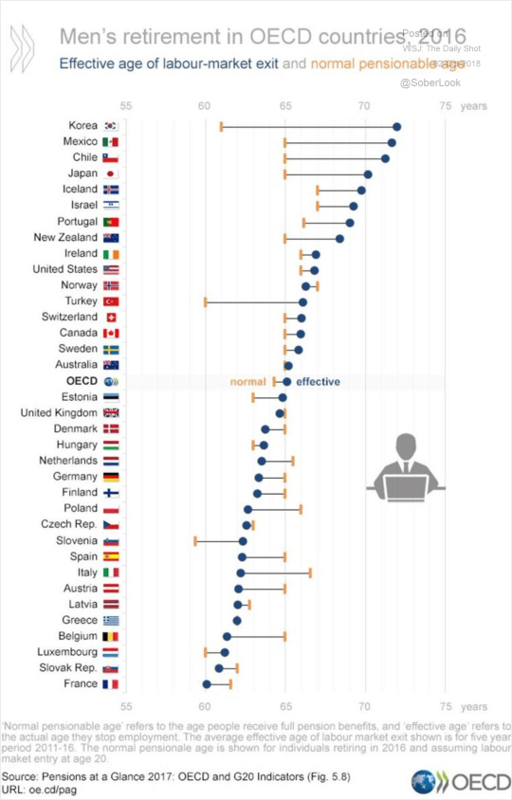 Looking at recent research workforce departure among OECD countries, we can see some countries leveraging older workers, while others (US and UK in particular) do not. Will you still need me, will you still and feed me when I’m 64? Many state and private pension funds (except for Social Security) are grossly underfunded and unprepared for the progressive growth in lifespan. The finances of private, state and union-based pension schemes are atrocious. Public servants who stand up, draw attention to this problem and attempt to repair these deeply flawed systems are often run out of town on a rail. Physically, lifestyle changes, accessibility and medical breakthroughs have improved quality of life for a large proportion of those over 65. Culturally, those who are over 65 don’t look or act their age! Take a trip to Las Vegas or a cruise in the Mediterranean to see what I mean. Yet the legacy restrictions and biases against aging are marbled throughout our society. There is even a word for it – “ageism”. Culturally, we are overtly against “ageism.” The resistance to “retirement” is subtle. There is a portion of the population over 65 who move gracefully – some even eagerly – toward a less hectic lifestyle where, they believe, they will have more control over their day-to-day activities. There is another proportion of the population over 65 who have no interest in retiring, or leaving the workforce, yet some are forced, one way or another out of employment or the professional activities in which they would prefer to persist. The cultural code, or metaphor for “retirement” is giving up. Therefore, Clint Eastwood’s character in Gran Torino reacts so negatively to the suggestion that he leave his home. The entreaty by his daughter and son-in-law to consider a “retirement home” is suggesting that the old man should “give up”, and this is judgmental ageism. Linguistically, this is also why the American Association of Retired Persons became AARP, eliminating the word “retired” from their brand, and why you will have a hard time finding the word in their printed material. Some of my clients resist suggestions to expunge the word from websites, promotional materials and sales scripts only because it’s hard work to conjure alternatives. We need repairs to the finances in the deeply flawed pension schemes, significant changes to work rules which limit otherwise fit individuals from continuing to work and public discussions about transitioning gracefully, which allow families to discuss retirement frankly, sensitively and compassionately. Please hurry up; I’m not getting any younger.